Legal frameworks are the bedrock for any effective management system. They underscore the importance of articulating a set of aspirations in concise directives and regulations, offering guidance to the myriad of field operatives and interventions in the varied sectors of migration management, development or the society at large. For the migration sector in Nigeria, it has been a long, tough journey to the adoption of the National Migration Policy and its implementation framework. The Policy is widely considered a breakthrough piece of legal document which came to fruition on account of years of toil by a host of government functionaries, development actors, the academia and civil society organizations. The Policy comes at a very important time in the global migratory scene with the rise in international migration across the Mediterranean resulting in multiple deaths. 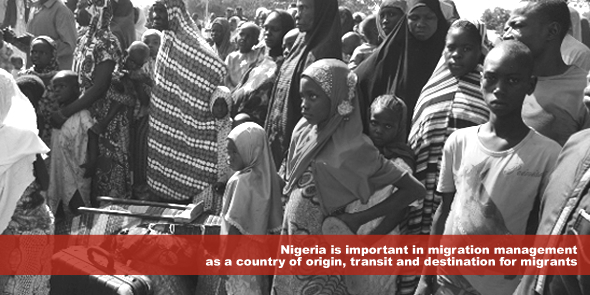 With over 170 million citizens, Nigeria is important in migration management as a country of origin, transit and destination for migrants. Nigeria faces challenges such as effective diaspora engagement and remittances, inter-regional, rural-urban migration flows, migration of highly skilled and unskilled labour, data generation, as well as trafficking in persons to mention a few. To briefly set the context, with the existence of a plethora of ministries, departments and agencies, civil society organizations and international development actors, made worse by cross cutting nature of migration itself, the necessity for a policy direction cannot be overemphasised. Needless to say, the history of migration management in Nigeria has been fraught with a number of challenges some of which are low capacity of actors, lack of coherence exacerbated by multiple (well meaning) actors often driving conflicting programmes, overlapping roles, misunderstanding and mistrust and of course age long inter-agency rivalry. The result of the above is the perception of enthronement of competition over complementarity in the design and implementation of programmes. In my opinion, the greatest challenge was the absence of a legal framework; of a unifying platform for engagement, information dissemination and overall coordination with a focused leadership deriving authority and legitimacy from an undisputed mandate. The Policy tries to address the above challenges, conferring the coordination role on the National Commission for Refugees, Migrants and IDPs (the Commission) which in recent times have been playing this role reliant on the 2009 Presidential Directive expanding its mandate. The Policy document spans several themes of migration including migration and poverty, migration and gender, national and human security, migrant smuggling, human trafficking, return, re-admission, reintegration of migrants; border management, health, diaspora, education, migration data management to mention a few. Through the years, there has been a new understanding of the role of development actors and the manner of engagement with national institutions. Language and operational shift in international development cooperation has evolved from dependency to a partnership model, increasingly tending towards empowerment and support to national institutions to take charge, for sustainability and continuity, of development initiatives. The Commission as the focal agency for migration management enjoys robust partnership with international development actors who offered technical expertise during the policy elaboration process. Today, the country is proud to be one of the foremost African countries to adopt a comprehensive and homegrown national migration policy with an implementation framework. A distinctly appreciable feature of the Policy is the inclusion of the migration governance architecture. This governance structure is an effort to concretize a workable migration administration structure in Nigeria in order to harness the potentials of, and linkage between migration and development. Reliant on the provisions of the Migration Policy, the governance structure affirms that effective coordination is crucial to the successful implementation of the Policy, particularly the need for it to address coherence and the development of synergies among the actors with thematic mandates on cross cutting aspects of migration to minimize overlaps and offer clear direction. It further establishes sub groups: Standing Committee on Diaspora Matters; Labour Migration Working Group; Working Group on Migration Data Management; Stakeholders Forum on Border Management; Assisted Voluntary Returns and Forced Migration. Under the overall coordination of the Technical Working Group on Migration and Development chaired by the Commission, the government is able to establish a structure within which all actors can work in synergy reducing overlaps, encouraging collaborations and information dissemination across board. With this structure in place, the foundation is firmly set for a more effective migration governance in Nigeria. There is room for great improvement no doubt, particularly in areas of capacity building, information sharing and awareness raising on the existence of the Policy and generally enlarging the space for dialogues and engagement. With its adoption, there is little doubt migration management in Nigeria is set on course for more efficient and effective management; and can only improve with continued diligence and hard work of all actors. *Views expressed in this article are the author’s personal reflections and does not reflect the official position of IOM or UN OCHA, unless specifically stated. Uche Hilary-Ogbonna holds a Bachelor of Laws (LLB) from Enugu State University of Science & Technology, a BL from the Nigeria Law School (Nigeria) and an LLM from the University of Pretoria (South Africa). A DAAD scholar, Uche is currently Humanitarian Affairs Officer with the United Nations Office for the Coordination of Humanitarian Affairs, Abuja (UN OCHA). She was formerly International Organization for Migration (IOM) Migration Officer seconded to the National Commission for Refugees, Migrants and IDPs.